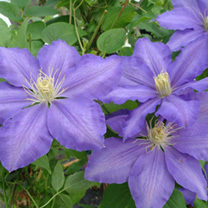 Clematis 'Lasurstern' has large, star-shaped flowers with a pale violet colouring, and creamy-white stamens. Two flushes of flowering, from early summer, and again in late summer. Grow through a tree, or around a pergola post. Prune lightly after first flush of blooms. Flowers July-August. Height 301cm+. Supplied in a 3-4 litre pot.